The film is directed by Kevin Connolly, who portrayed “E” on HBO’s “Entourage,” and he takes a Citizen Kane-like approach to telling the story, jumping around in the eras of Gotti’s reign, anchored by his relationship with John Jr., who followed in his father’s footsteps until desiring to leave the “life” and avoid prison (the film used John Jr.’s book “Shadow of My Father” as its centerpiece source). There is a lot of material in the film, but it is buttressed by John Travolta’s tour-de-force performance of the title character, and the use of actual news footage to flesh out the different prosecutions of Gotti’s life. If you are fascinated by the New York City ethos of organized crime, then “Gotti” will take you on that mystery trip. The film opens with a dying John Gotti (Travolta) meeting with his son John Jr. (Spencer Lofranco) in the late 1990s during his incarceration in federal prison in Springfield, Missouri. The meeting frames John Gotti’s story, expanding on his life before and after becoming the boss of the Gambino crime family. It also is a final confrontation between father and son, as John Jr. desires a different path. The essential characters of John Gotti’s life are peppered throughout the biography. His wife Victoria (Kelly Preston, Travolta’s real life wife), his mentor Aniello Dellacroce (Stacy Keach), his best friend Angelo Ruggiero (Pruitt Taylor Vince) and Sammy “The Bull” Gravano (William DeMeo) all have a role in the rise and fall of this high-profile Godfather. But can he forgive his son for wanting to walk away from it? Travolta does the heavy lifting in the film, portraying Gotti during a period of nearly 30 years. 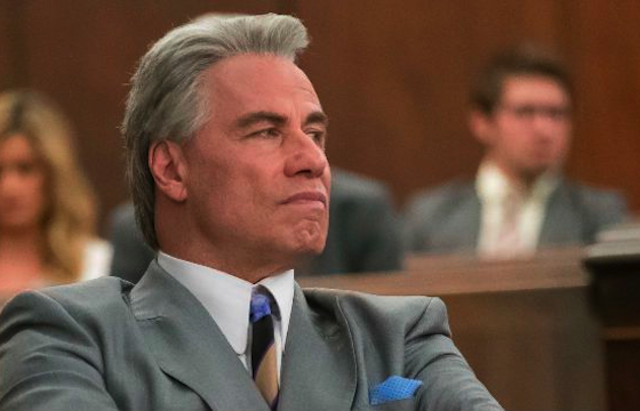 Travolta’s still youthful looks are perfectly suited to believability in all the eras, and he even appears without toupee as Gotti in old age. He creates a foul-mouthed rhythm with the character, never applying too much gas to the “dems” and “dose.” His Gotti must deal with constant death, blind ambition, betrayal and pride throughout a number of terse and hopscotching scenes. In the character phase of his acting career, Travolta continues to own his portrayals. Kelly Preston lent her support admirably as Victoria Gotti. Preston and Travolta have the chemistry of husband and wife in real life for over 25 years, and their interaction as the “partners in crime” had a familiarity that was naturalistic. The Gottis’ 12-year-old son Frankie was killed in an accident in 1980, and Travolta/Preston lost a son (Jett Travolta in 2009) in their lives. The scenes in “Gotti” dealing with Frankie’s death had an air of agonizing authenticity, as if peering at something that shouldn’t be seen. There are some difficulties with the film, but not enough to derail it. The hopscotching of scenes needed apt attention to follow, and had a tendency to drift, plus the casting of Spencer Lofranco as John Jr. didn’t feel right. But the rest of the crew in the film were appropriate archetypes, especially Pruitt Taylor Vance as the doomed Angelo, who wore his dishonor on his sleeve. This is the lesson of a smaller role made more prominent by the excellent delivery of Mr. Vance. There is a line in “Gotti,” delivered by Preston’s Victoria, that expresses her frustration over the constant trials. “The government is also a criminal” she exclaims, and in organization and structure, she has a good point. What is organized crime and organized government than an bunch of people seeking a power through any means necessary? For a video interview with John Travolta of “Gotti,” by Patrick McDonald of HollywoodChicago.com, click here.